It has come and gone, and as usual it was fabulous. Here’s the brief lowdown on The Beefsteak: 300+ folks from my hometown (and their friends) pile into the town’s Parks and Recreation building every April. You pay about $40 to get in, and that gets you all you can eat beef slices on bread and french fries. This year it also got you a chance to win the Grand Prize, a 46″ LCD TV. Everyone brings nibbles, specialty drinks, etc. We had about a dozen folks, including our friends Laura Ann, Dan, and Ken, my brother and sister-in-law and a friend of theirs, and my mom and a friend of hers. Those who are truly dedicated to the evening don’t eat the bread from their dinner. They pile it up and create elaborate bread sculptures on their tables (as we do every year). 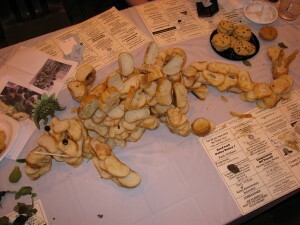 This photo is of the Stegasaurus our group made, which of course won! 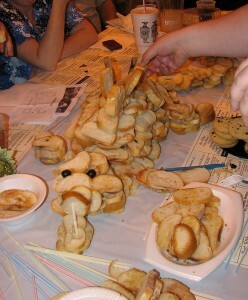 It’s our first win for the bread building competition, last year we were disqualified! This is because Laura Ann charmed a whole bag of unused bread from the kitchen, and we used cups and bowls and things for the infrastructure. It was clearly the biggest (and might I just add that in past years others used extensive non-food items for their structures? ), but we lost to a pineapple. This year we came equipped, including a plan from Laura Ann for our dinosaur. The only non-food items we used were straws (legal). I’d like to point out that I made that head when the engineers failed and requested an artist. He is complete with open jaw. But the scales on the back and french fry spikes on the tail are equally awesome. It was a brilliant team effort, we won a bag of Easter marshmallows. Then after all that, there are the prizes. That’s really the point of The Beefsteak, even though my tribe lives for the bread building. You buy tickets for prizes that range from baskets of picnic cups to Yankees tickets. Between our table we won a giant Easter basket (for my niece and nephew), a garden hose (the gag gift every year, which we took home), and 2 tickets to Medieval Times (those went to Ken, but we are all planning on going now). It is the biggest Rotary event all year, and I always look forward to it. Now we’ve got to get started planning for next year so we can defend our bread building title. And now it’s time to get ready to leave for Cancun tonight! We’re not even packed, and we’re sitting on the couch watching the Malaysian F1 Grand Prix. It’s going to be an interesting day, next time I post will be in Mexico!